Well pretty close anyway.So a lot of my time gets eat up with family and this happens to be of my habits/hobbies my dad and I have is collecting and restoring old Allis Chalmers tractors,hence the paint name for the color is Persian Orange for the AC Co. And since we just finished this one I thought why not,this is my other family and thought some ,or at least Farmerbrown would like it :).Also Tim gave us those green beauties of his some time back with the Caddy so figured I’d do a shot with an orange of another flavor. We’ve used AC tractors on our farm for as long as I can remember and we still have my grandfathers ‘53 AC model CA he bought on Jan 1 1953,the day my dad was born but we’ve had bookoos of other makes and primarily now use Kabota and CAT. This particular one is a 1935 AC model WC,hand crank & brake American steel which is the very first mass production tractor to have new fangled rubber tires. We picked this up from a really cool guy in Danbury Ct. which BTW I don’t really get why folks up north retire or just move down south to this summertime hell hole in the south....Connecticut is beautiful and NJ,Penn,NY,Del,Maryland!! Too cool! My grandfather was an A-C man, so of course Dad became one as well. He has both Grandpa's A-Cs from the 50s, virtually identical to yours (though I don't recall the model numbers). One is fastidiously restored; the other still works on what's left of that family farm. Taking a bone-jarring, teeth-rattling ride in a trailer behind the tractor on township roads has been a ritual my entire life. Dad's tractors have sometimes been configured in tricycle mode. Fabulous A-C story. Dad and Tru-Arc brother Steve took the restored tractor to a show in Ohio, hauling it on a trailer, getting it on and off via three ramps: one for each rear wheel, and an improvised one in the middle for the tricycled front pair. While at the show, they saw a guy get a tricycle tractor off a 2-ramp trailer by going off at an extreme cant, to get the fronts to follow one of the rear wheels down its ramp. They got home from the show late at night; Dad drove on home and left Steve with the job of off-loading the tractor from the trailer into his toy barn. Steve thought he'd try the 2-ramp method. Something went wrong...and he dropped the front end to the concrete floor. The tractor broke IN HALF. Steve then had to call Dad and tell him he broke Grandpa's tractor. It all came out well in the end; Steve found one like it way out west, brought it back, combined the two, and in the process did an overkill restoration the likes of which Dad would never have financed - and Grandpa would never have understood. But if you broke a family heirloom Gretsch in half, you'd fix it, right? These things are part of the family. So it's great to see your orange fleet. I know there are other brands, but to me "tractor" is spelled "Allis-Chalmers." Tim that story makes me cringe and I’ve seen that done so many times but I won’t try it. Yeah your right in the heart of AC country there in IN,the line kinda goes down from Minn all the way to LA and from Ohio down to WV and down the east coast. Kinda funny but my grandfather had an early 25-40 like this one many years ago and the early AC’s were damn near dark Gretsch green. What? No "Hoyt Clagwell" fans here? Nice old iron. We have a few Steam and Tractor shows around here. Wife's Dad had IH (made in Indiana) and my grandfather worked at Oliver (the good green tractors). My brother in law is an AC guy like you. In his hometown of Climax MI (the most inappropriately named town in the world) the kids all drove their Dad's tractors to school on the last day of the year. There's a guy here in town that bought the old AC dealership building just to house his collection. 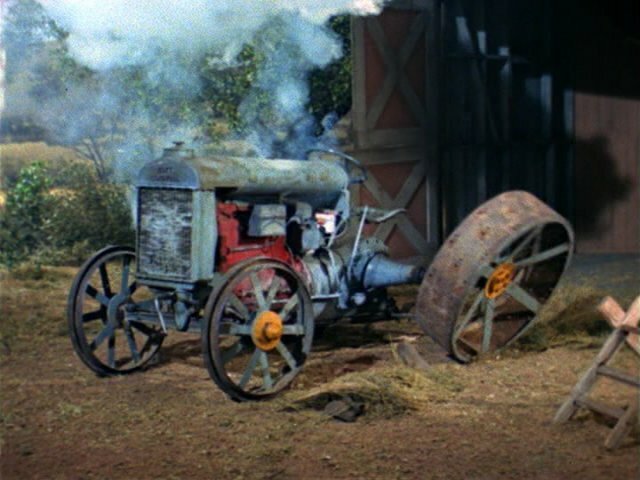 If you can get RFD-TV, there are tractor shows much like the car programs on other networks. Thanks Slim...Dad also has ‘49 H model International,a H Model Deere and I have a 641 Ford Workmaster so we have some of the other flavors too and Dad says if he can find an Oliver 88 in decent shape he’s going to get one. My parents watch RFD for the tractors and The Marty Stuart Show :) What’s the name of that old AC dealership or the guy that has it now?Next time my parents are up your way they may want to swing by,they have connections with other orange collectors scattered around.My Dad worked as a mechanic during high school(same dealership my grandfather bought his CA from ,Vause Eq Co) and Bobby Jr and my father are really close friends so Bobby helps locate possible tractors for sale but the older ones are getting harder to find. I don't know the name, but it's on Indiana 25 less than a mile south of I-65 on the north side of the road. It was also an IH dealership before. I'd gotten parts for my IH Scout there. Been awhile since I've been by there. Your second pic looks very familiar. My grandfather had one and I was taught how to operate it when I was old enough to help with planting the tobacco. Orange paint had that same faded look. Those were good times although I was not cut out to be a farmer. Became a lawyer instead. And my wife is of Hungarian decent. 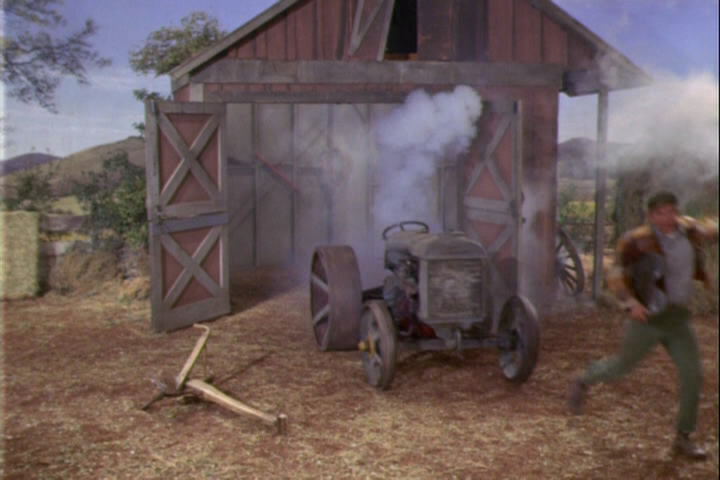 I just realized I based my life on Green Acres in reverse, how weird! They should've come thru here in the summer. Lots of steam and tractor shows in Indiana. Tell them to check the Indiana tourism website for future shows. You see lots of implement sales around as well. I'm a city kid, and first went to one of these tractor shows with the in laws. Had a ton of fun. My working at an ag school added to it. The smell of oil and gas, firewood, and so on, and lots of big powerful machines was cool. I lived around the corner from two guys that shared a shed to house their steam tractors. Another brother in law collected hit and miss engines with water jackets. Near my home town in La Porte IN, there was a company called Rumley Oil Pull Tractors. Oddest tractors I've ever seen. If you live in farm country, it'll rub off on you. Perhaps, but did you buy "The Haney Place?" Yeah the second pic was when we picked it up from in Danbury,it was actually used as a pulling tractor and I thought Dad was going to leave it alone but he couldn’t help it.My brother did the same thing.... owns his own painting company,had enough of farming after school. I will definitely let them know,it’s just normally they don’t like to travel much from around May until the last of August. Cool! Old tractors are great ! Old tractors make great drummers too. Cool old beasts. We had a Massy Harris that was about the same color. In Nova Scotia it was Ford, Massy Harris, Massy Ferguson, and John Deer; a few old guys used horses until the end. I've always loved the WD-45, never owned one. Dad had a190XT back in the 70's. I have 4 old Farmall tractors, here is my '62 460 Diesel.